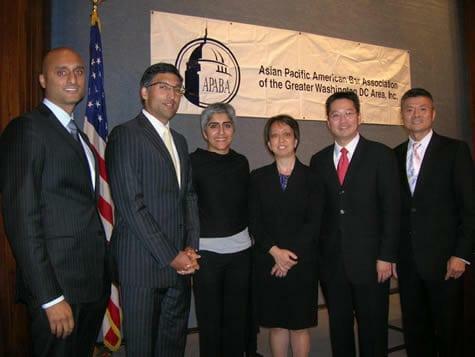 WASHINGTON–White House Initiative on Asian Americans and Pacific Islanders Executive Director Kiran Ahuja has urged the Asian Pacific American Bar Association-(APABA) D.C. to keep on being engaged in the community’s well-being. She stressed the role of the Initiative, “which is really about expanding the work of the community advocate.” This involves “breaking down barriers,” expanding efforts on translation needs, and providing robust data on services to the underserved. Ahuja was the keynote speaker at the APABA-DC induction on September 15 held at the National Press Club Building in this capital. She spoke to a packed audience of 220 APABA-DC members and guests, led by Acting U.S. Solicitor General Neal K. Katyal, who gave welcome remarks, and Associate Judge Brian G. Kim of the District Court of Maryland for Montgomery County. Keynote speaker Ahuja lauded President Barack Obama’s resumption of the Initiative, which was started by President Bill Clinton to address the nation’s disparities in attending to the needs of the underserved. She said, “The role of the federal government is to provide protection and services” to all Americans. Ahuja, whose family is originally from India, said the country has gone a long way from the time she grew up in Savannah, Georgia, where there were only “three of us in school” who were Asian Americans. But even with the progress made in education, business and other fields, and even with a record number of Asian Americans in the administration, 14 million Asian Americans and Islanders still have a long way to go, she said. Acting U.S Solicitor General Katyal traced the historical challenges faced by the nation’s Asian Americans. He gave a scholarly presentation of the legal arguments of solicitor generals, as well as Supreme Court decisions, on the Chinese Exclusion Act and the Japanese interment during World War II. He said at one point, a solicitor general argued that granting citizenship to the Chinese would “taint and diminish the honor of American citizenship.” The Supreme Court, noting “Our Constitution is color-blind,” rejected this argument. In her remarks on her term, outgoing APABA-DC President Yoon, who also served as emcee, noted progress in mentorship programs, increased membership (over 500), and “rigorous standards in endorsement policy,” as well as reaching out to Asian Americans “to consider becoming a judge.” Yoon is an associate in the Insurance and Bankruptcy Groups in Crowell & Moring’s office in the nation’s capital. Reprinted with permission of Asian Fortune.